For over a thousand years, bilberry has been incorporated into European medicine as a treatment for diarrhea. 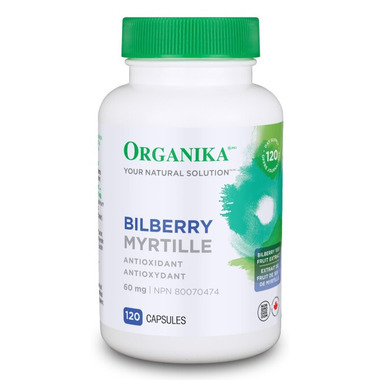 Organika®'s Bilberry Capsules provides 60 mg of bilberry (Vaccinum myrtillus)to act as an astringent to help relieve diarrhea and provide a source of antioxidants. For diarrhea relief and a source of antioxidants, maintain good health with Organika®'s Bilberry Capsules. NON-MEDICINAL INGREDIENTS: Gelatin (Capsule), Blueberry Fruit Extract, Rice Powder, Magnesium Stearate. It's too soon for me to tell how beneficial this will be, but my father has routinely taken it daily for years and swears by it.